snowdeal.org > ex machina: the eric update - day 1014: odin's new, big, big world. the eric update - day 1014: odin's new, big, big world. 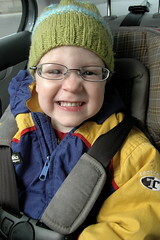 without a doubt, we couldn't be more pleased with how well odin has adjusted to having his new glasses. over the weekend we went on an adventure to "the city" ( a.k.a. la crosse ) and to give us more errand running time, we started out at what would have been odin's naptime, thinking he'd quickly fall asleep in the car. instead, he politely refused to go to sleep and proclaimed, "i need to keep my eyes open so i can seeeeeee everything!" before counting all the storage silos along the 40 mile trip ( there are a lot of silos ). and during our shopping adventures it was amazing to watch him point out this or that detail in his environment that would have previously gone unnoticed. he's soaks it all up and enjoys providing running commentary with loads of details ( hmmm, i wonder where he gets that from? ). at first he wasn't as interested in wearing them around the house, presumably because he didn't get as much benefit from them in familiar surroundings, but he's wearing them more often and reportedly keeps them on all day at school. and my fears of quickly losing or damaging his glasses seem to have been completely unfounded as he's very careful with them and treats them with far better than i did my own glasses when i was years older than he is now. most of his schoolmates and regular playmates knew he was getting glasses and have been very supportive, but i remember getting teased on the play ground about my glasses and it's probably foolish to think it won't happen sooner or later. i wonder if it's much less of a problem now that kids are getting examined and given glasses at much earlier ages than they did "back in the day"?